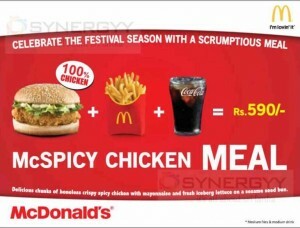 McDonald’s Srilanka offers McSpicy Chicken mean for the affordable price of Rs. 590.00. Delicious chunks of boneless crispy spicy chicken with Mayonnaise and fresh iceberg lettuce on a sesame seed bun. 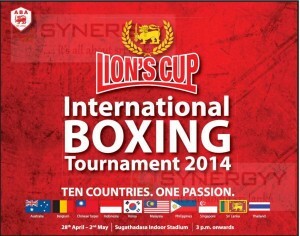 ABA Srilanka organised a Lion’s Cup International Boxing tournament 2014 from 28th April to 2nd May 2014, with the participation of 10 countries of Australia, Belgium, Chinese, Taipei, Indonesia, Korea, Malaysia, Philippines, Singapore, Sri Lanka and Thailand. 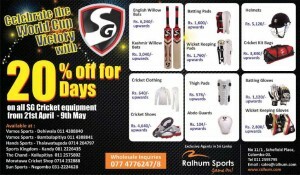 Ralhum Sports offers a special promotion for the SG Cricket equipment Discounts upto 20% from 21st April – 9th May 2014. 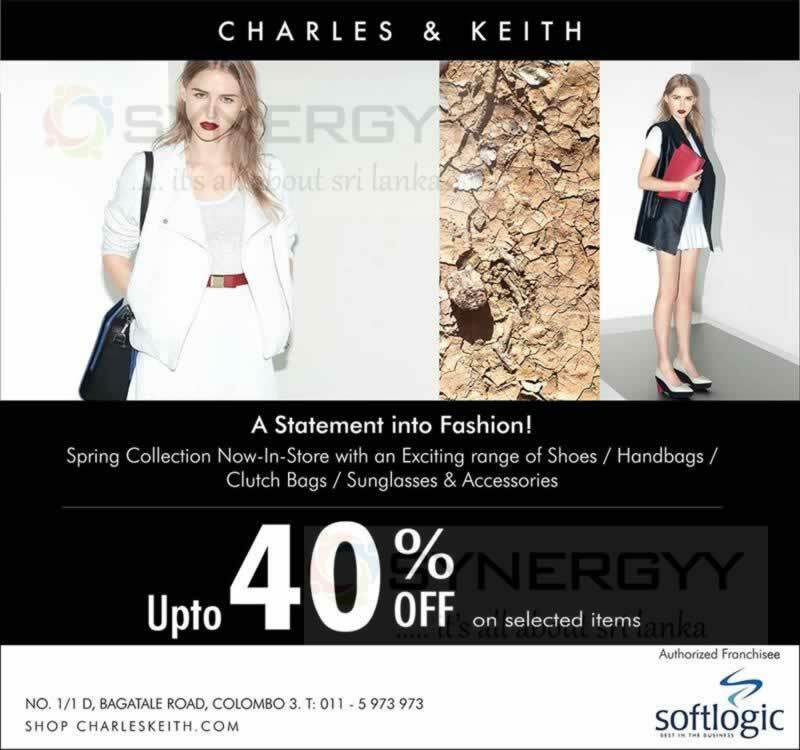 Amante a Srilankan Branded Lingerie, Sportswear, Swimwear and Sleepwear manufacturer and retailer offers an amazing promotion of 25% off for Sampath Bank Credit card at amante Boutique, Racecourse Mall, Colombo 07. 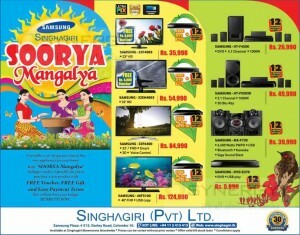 Sighagiri a Authorised dealer of Samsung portfolio in Srilanka; offers wide range of Samsung branded Washing Machine, Mobile, Camera and Laptop at an affordable price. British Airways celebrating their first anniversary of their Colombo Service with 3 days of special fares when you fly from Colombo to Male. 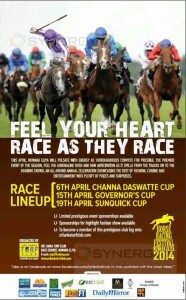 Return fares from Rs. 12,975.00 in world traveller, economy class including taxes. 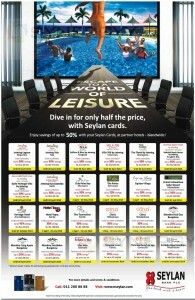 The offer is only valid till 25th April 2014 at www.ba.com or contact your travel agent. it’s the time for new beginnings and festivities When gifts are exchanged, homes are refurnished, new additions are made and lifestyles are upgraded. And the best place to find everything you need is Singer Mega. In keeping with tradition, this year, we are spreading prosperity and good fortune. 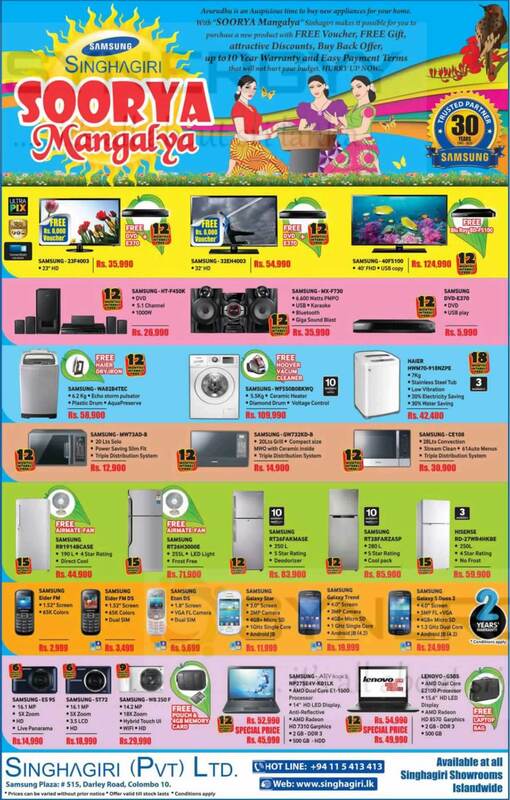 We nave an array of special discounts, trade-in deals and cash rewards on a wide range of electronics, home appliances, furniture and more. 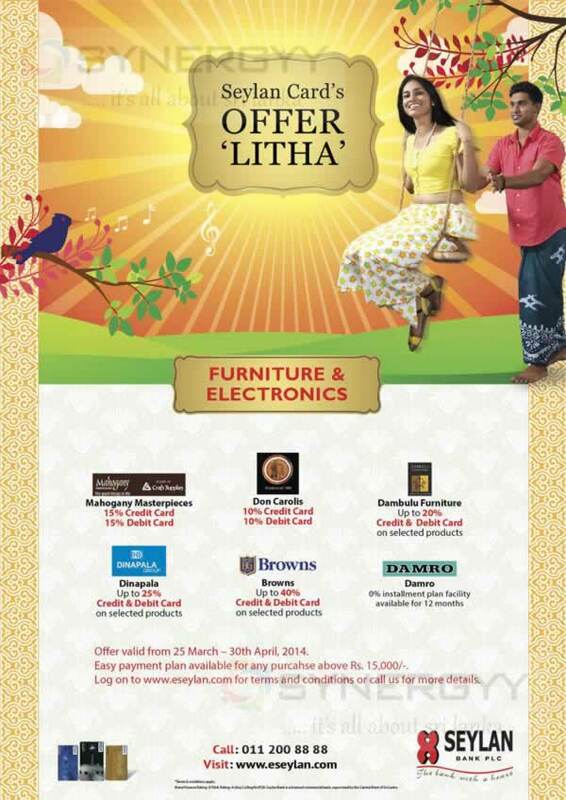 * Offers Valid Until 30th April 2014. 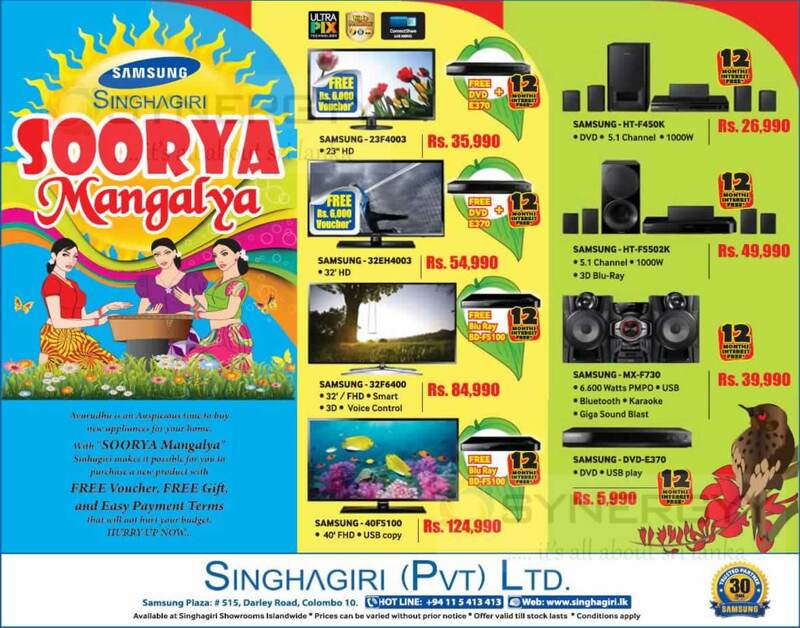 Samsung Singhagiri offers a wide range of promotions for this New Year Season; the below offers are valid till 30th April 2014.
for more details see below image or visit Singhagiri (Pvt) Ltd; Samsung Plaza: # 515, Darley Road, Colombo 10. The issuance of annual licences for domestic elephants has been extended until April 30, a Wildlife Conservation Department official said. The official said the department issued about 300 licences so far for keeping domestic elephants, adding that the majority of them were issued to the National Zoological Department. He said after this deadline, raids would be conducted and legal action taken against the owners who keep domestic elephants without a valid licence. The official said the suitability of the owner of the elephant is checked before a licence is issued. Certified documents including six side photos of the elephant, a note on how the animal was received, duration of possession, the purchasing receipt and other information should be submitted with the filled application form of the department when applying for the licence. 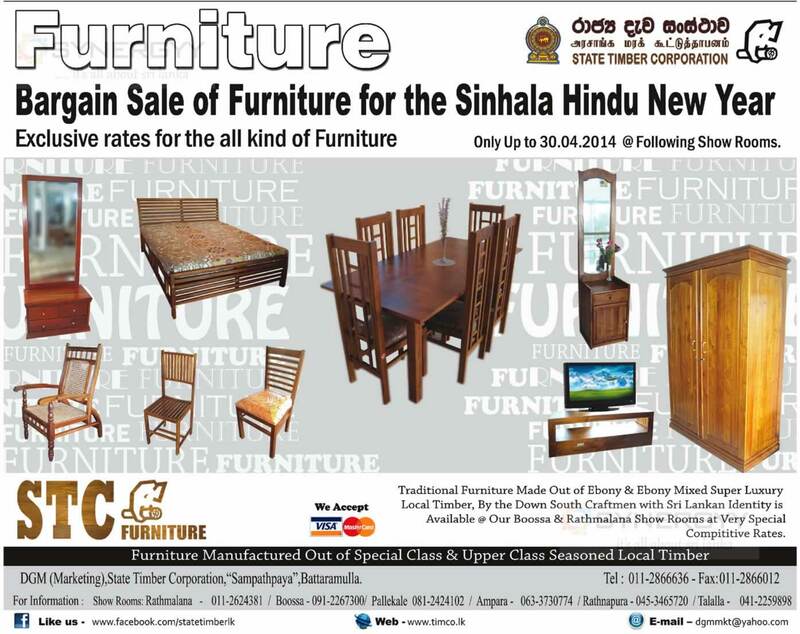 Traditional furniture made out of ebony & ebony mixed super luxury local timber, By the down south craftmen with Sri Lankan Identity is Available at STC Boossa & Rathmalana Show Rooms at Very Special Competitive Rates. 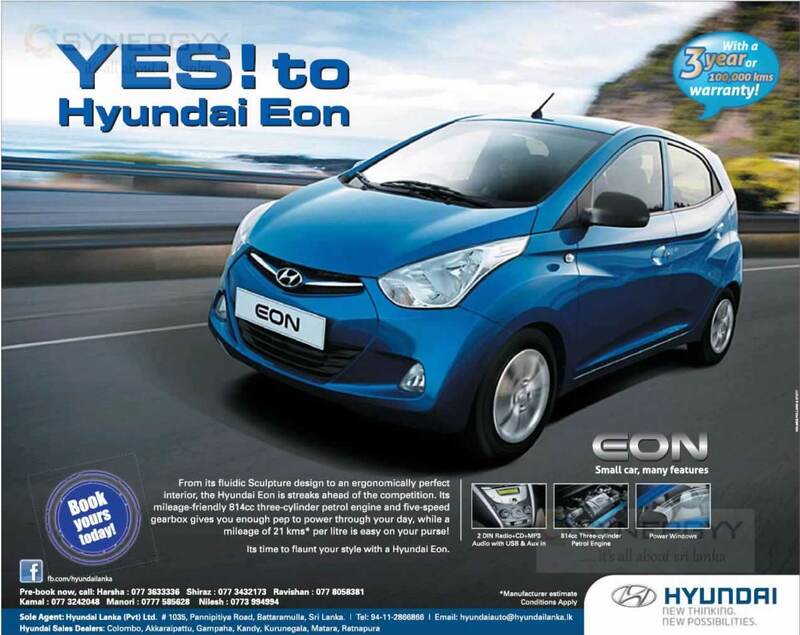 From its fluidic Sculpture design to an ergonomically perfect interior, the Hyundai Eon is streaks ahead of the competition. Its mileage-friendly 814cc three-cylinder petrol engine and five-speed gearbox gives you enough pep to power through your day, while a mileage of 21 kms per litre is easy on your purse! 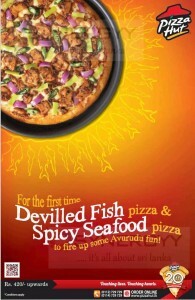 Hyundai Lanka (Pvt) Ltd. # 1035, Pannipitiya Road, Battaramulla, Sri Lanka. 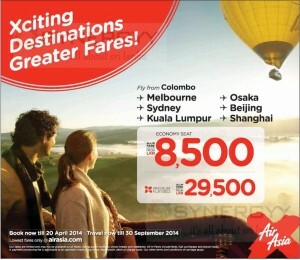 The Budget Airline Air Asia offers special prices for your tour from Colombo to Kuala Lumpur for all inclusive one way fare of LKR. 8,500.00 For economy seat. You could enjoy premium flat bed facilities for all inclusive one way fare of Rs. 29,500.00upwards. 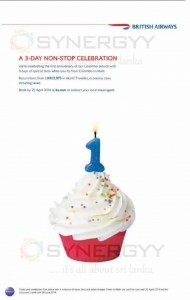 Our seats are limited and may not be available on all flights during Public Holidays, school breaks and weekends. All fares Include fares, fuel surcharges and airport taxes. A payment processing fee is applicable to all payments made using direct, credit, debit or charge cards. Our other terms and conditions of carriage apply. 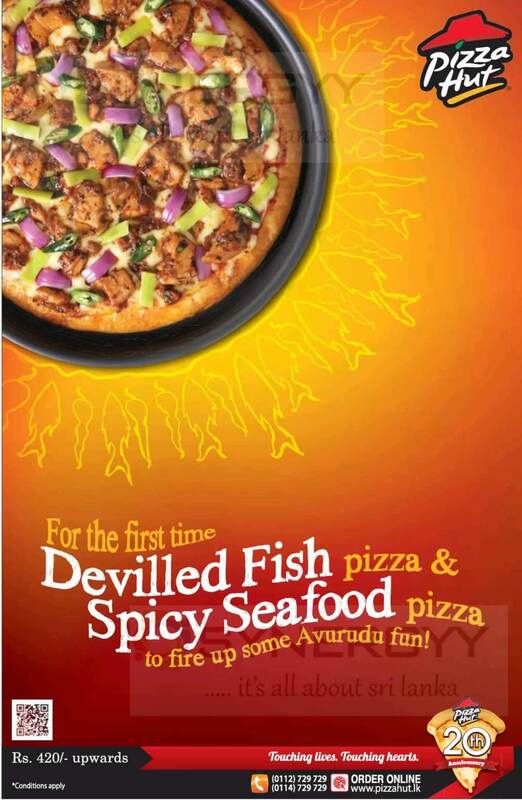 Offer valid from 25 March – 30th April, 2014. 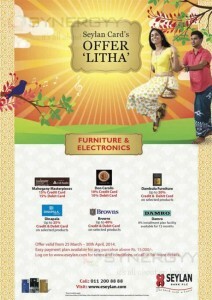 Easy payment plan available for any purchases above Rs. 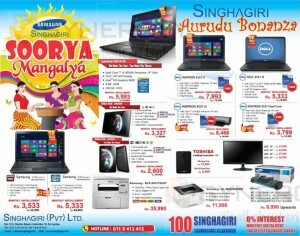 15,000/-. 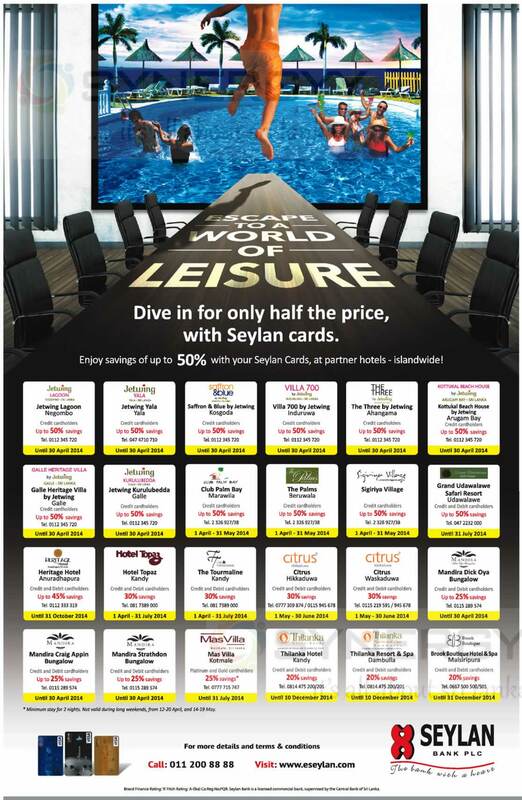 Seylan Banka announces a special discount Promotions from a leading hotels in Srilanka, the offers upto 50% off from 1st April to 31st December 2014*. 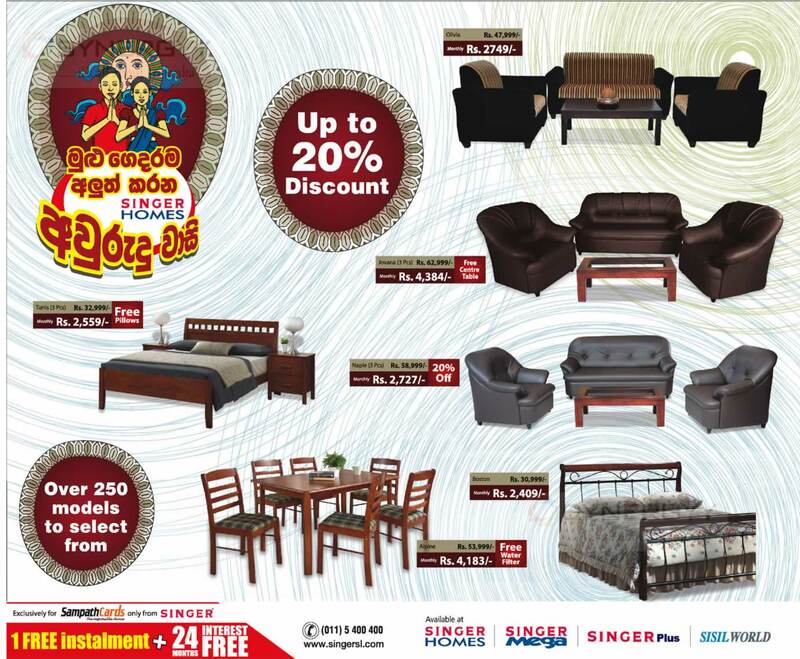 Singer Srilanka offers you the below prices for the seasonal month of April 2014, the offers are valid till end April 2014. The Singer Srilanka announces a special promotion for this New Year season with an attractive instalments scheme for Sampath Bank Credit Cards. 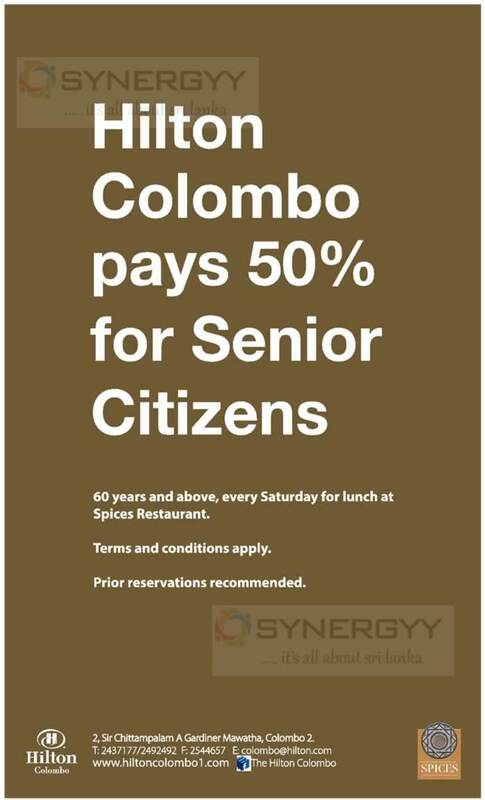 The Spices Restaurant at Hilton Colombo offers 50% off Senior Citizens; those who are 60 years and above could enjoy a special 50% off on every Saturday for lunch. 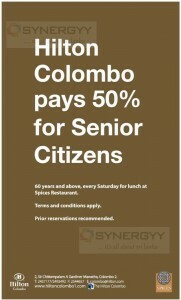 For more details contact to Hilton Colombo at #2, Sir Chittampalam A Gardiner Mawatha, Colombo 2. 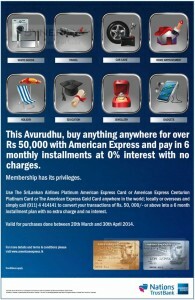 This Avurudhu, buy anything anywhere for over Rs 50,000 with American Express and pay in 6 monthly installments at 0% interest with no charges. 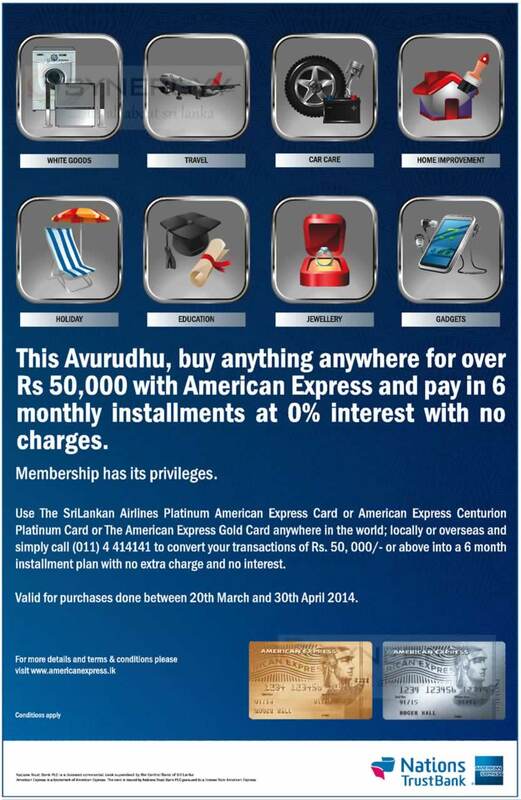 Use The SriLankan Airlines Platinum American Express Card or American Express Centurion Platinum Card or The American Express Gold Card anywhere in the world; locally or overseas and simply call (011) 4 414141 to convert your transactions of Rs. 50,000/- or above into a 6 month instalment plan with no extra charge and no interest. 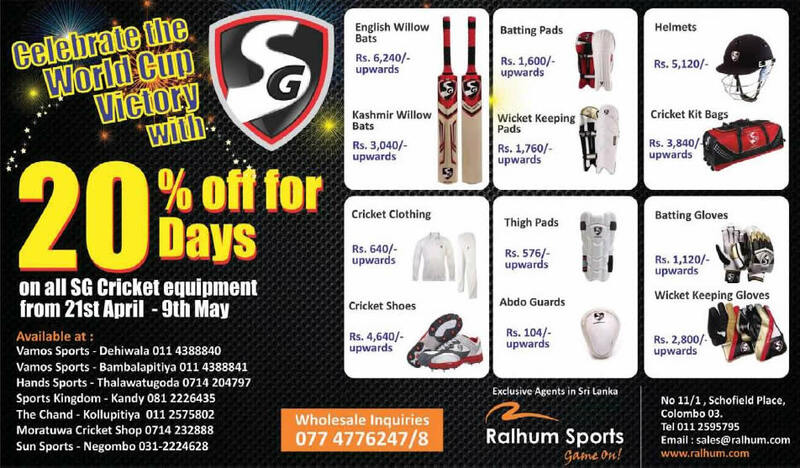 Valid for purchases done between 20th March and 30th April 2014. 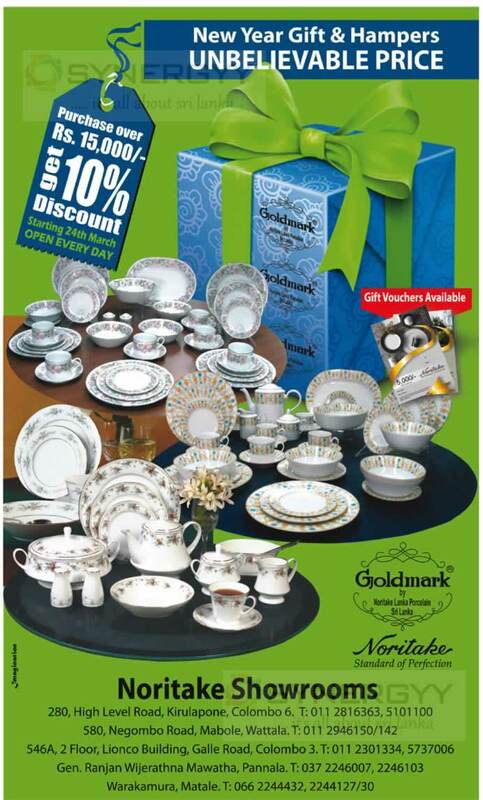 Noritake announces a special promotions for the new year season April 2014 for their gift ranges as 10% off on purchases over Rs. 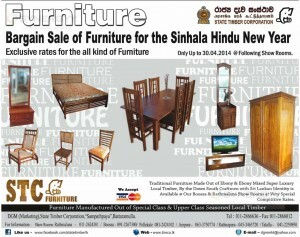 15,000.00 till 24th March 2014. 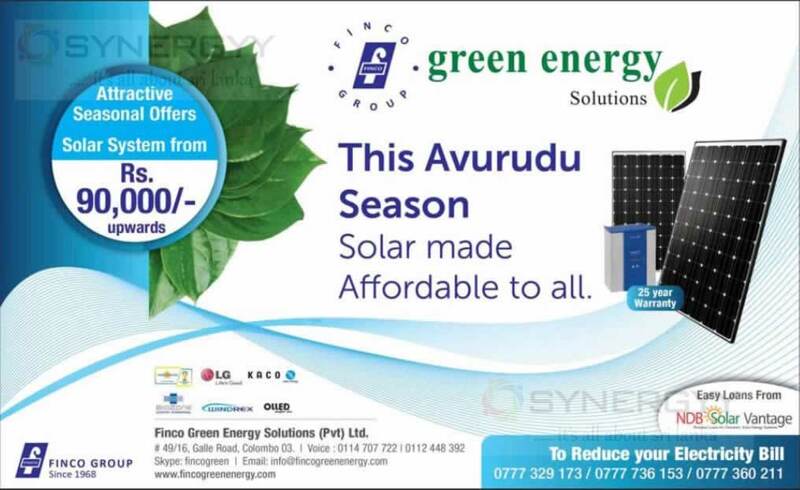 The Finco Green Energy Solutions offers a great concepts for this Avurudu Season as Green Energy Solar made Affordable price. 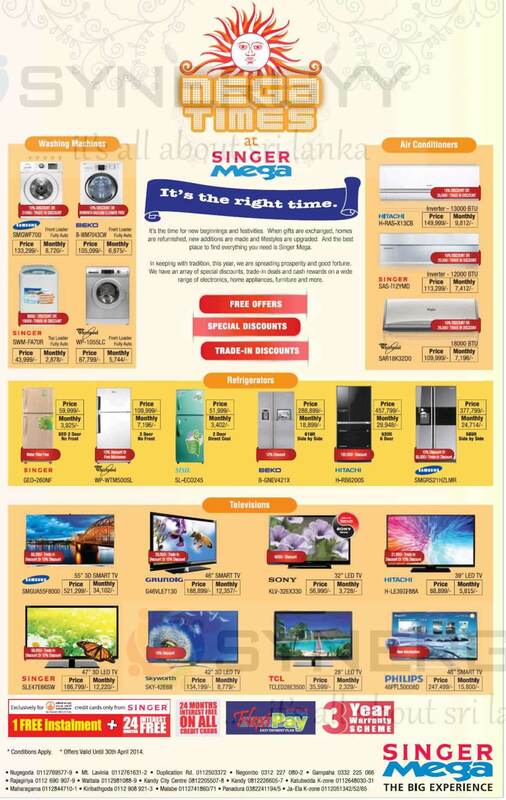 Attractive Seasonal Offers Solar System from Rs. 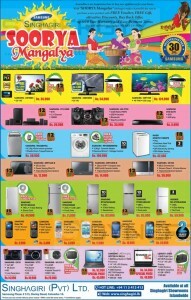 90,000.00 Upwards and enjoy a easy loans from NDB Solar Vantage. 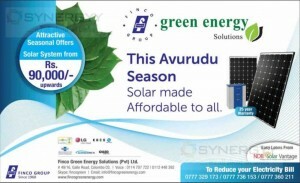 Finco Green Energy Solutions (Pvt) Ltd.
49/16. 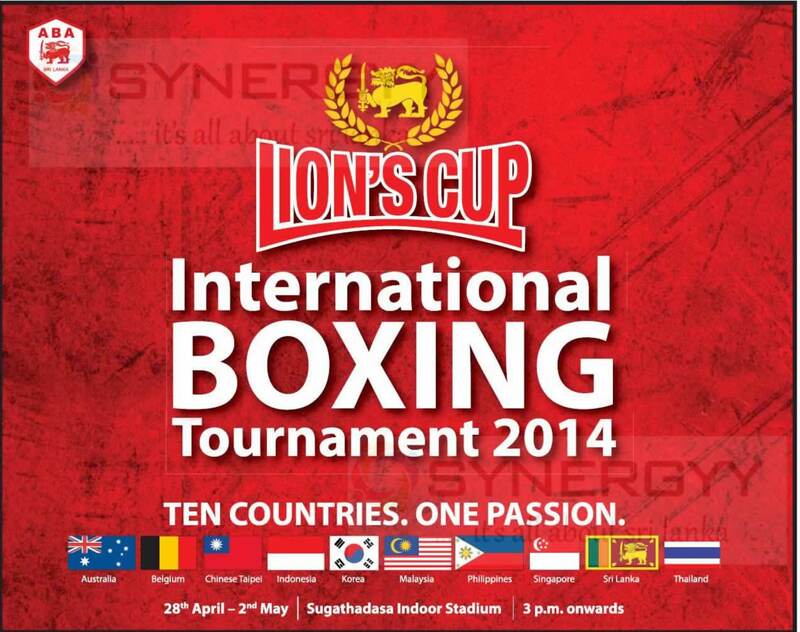 Galle Road. Colombo 03. The EDEN Resort & Spa an subsidiary business of LOLC; and offers a special offer for your holiday seasons to enjoy with beach front nature at an affordable price. 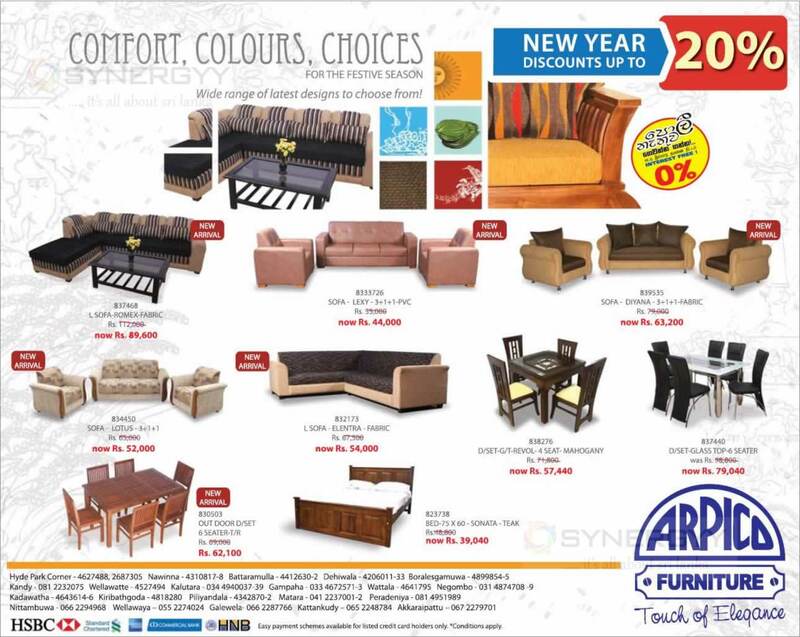 Arpico Furniture a leading furniture manufacturer in Srilanka offers a special promotions for the Home Fruiterers at a special price for this new year season. Micro SSangYong Rexton W has evolved into one of Sri Lanka’s best SUVs which remains true to the brand identity, while new, upgraded elements maximize the pleasure and value that this superb SUV delivers. The “W” in the name stands for “work of art” and “world class”, underscoring the modern and sophisticated design concept. The diesel RX270XDi and The diesel RX270XVT, with 2,696cc also with direct fuel injection, offer both economy and power. Maximum output is 165ps and maximum torque is maintained over virtually the entire rpm range, for quick engine response and outstanding acceleration when passing. The petrol RX320 with 3.2-litre, six-cylinder and features electronically-controlled engine mounts and oil pan integrated with the front axle for lower propeller shaft noise. 5-speed automatic The E-tronic automatic transmission, built with Mercedes-Benz technology. Features a sporty driving option, Switches on the gearshift knob and steering wheel let the driver shift gears up or down manually. Speed sensitive power assisted rack and pinion on Power-up (AWD) version. All the specifications, features and equipment detailed on this page are based upon the latest information at the time of publishing. Micro Cars Limited reserves the right to make model and specification changes at any time without prior notice. 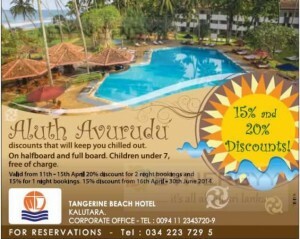 Tangerine Beach Hotel offers you an Aluth Avurudu discounts that will keep you chilled out on halfboard and full board. Children under 7 stay for free of charge. Valid from 11th to 15th April, 20% discount for 2 night bookings and 15% for 1 night bookings. 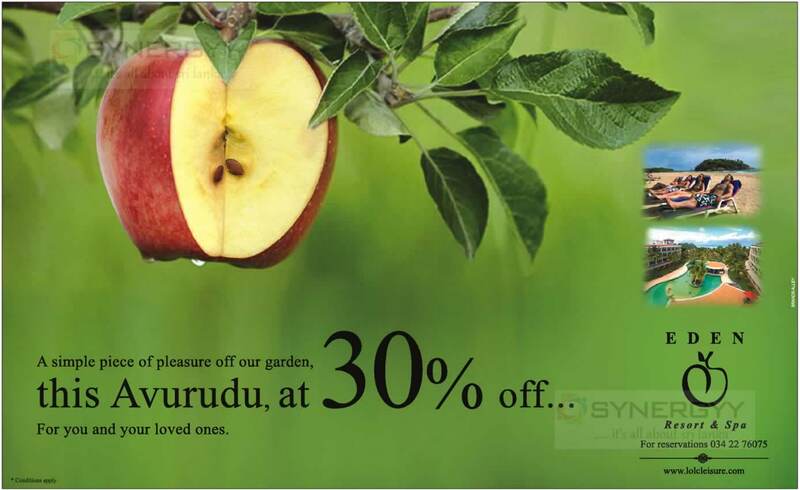 15% discount from 16th April-30th June 2014. 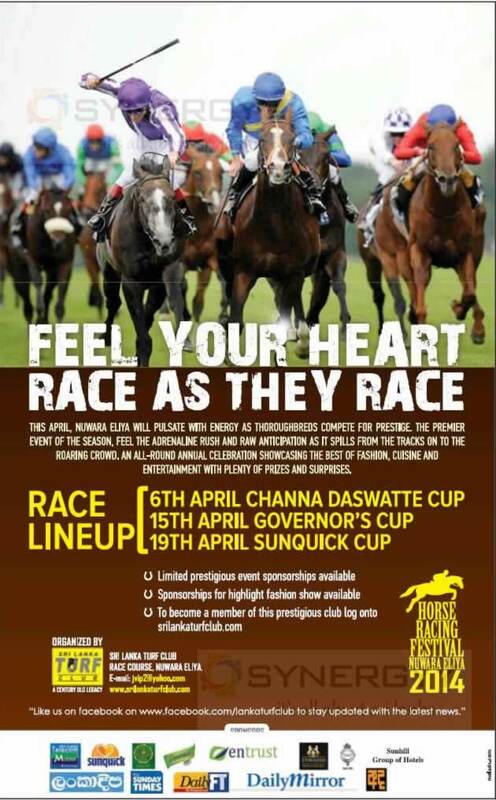 This April, Nuwara Eliya will pulsate with energy as thoroughbreds compete for prestige. The premier event of the season, feel the adrenaline rush and raw anticipation as it spills from the tracks on to the r0arin6 crowd. 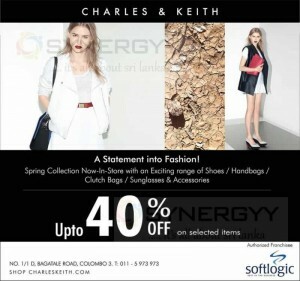 An all-round annual celebration showcasing the best of fashion. 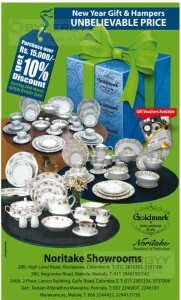 Cuisine and entertainment with plenty of prizes and surprises.